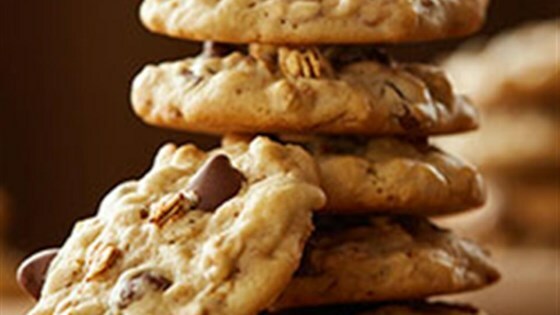 "Granola is a delicious addition to these classic chocolate chip cookies." Heat oven to 350 degrees F. Coat baking sheets with no-stick cooking spray. Beat shortening and brown sugar in large bowl with electric mixer on medium speed until creamy. Beat in eggs, milk and vanilla. Combine flour, salt and baking soda in medium bowl. Add to egg mixture. Mix well. Stir in granola and chocolate chips. Drop by rounded tablespoonfuls onto prepared baking sheets. Bake 9 to 10 minutes or until bottoms are lightly browned. Cool 2 minutes. Remove to wire rack to cool completely. not liking these cookies are like hating breakfast. crazy and stupid. came out delicious!! I followed the recipe and it was delicious, not too soft and not too crunchy!